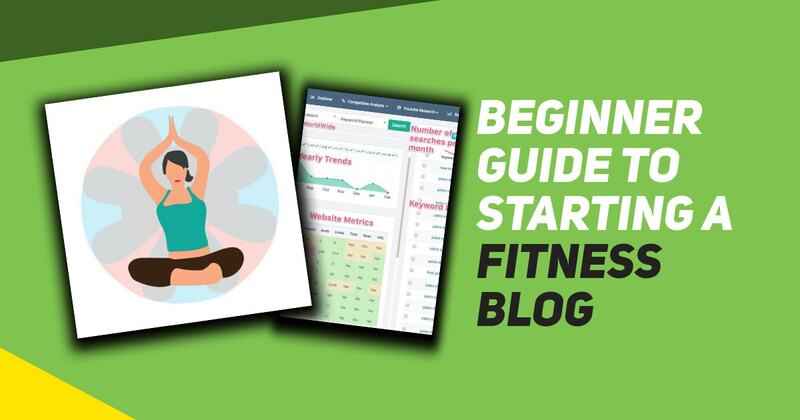 This guide to starting a fitness blog for beginners will show you how to avoid costly mistakes, how to set up a traffic-generating website, how to find topics to write about, and how to dominate your fitness niche. Starting a fitness blog is easy. It’s easy because the tools at your disposal for creating a fitness-related blog are not expensive or difficult to use. But I’m not trying to create unrealistic expectations. Starting a blog in 2019 in any niche, is as easy as clicking a few buttons. The technology available for building blog has both come a long way in only a handful of years. The problem is that the low barriers to entry lead to higher competition. Beginning is easy. Growing is hard. It’s easy to get going but hard to get traction, unless you have a blueprint for starting a blog. Your blog isn’t just a personal diary where you write about random fitness topics. You want to get traffic to your website. You want to build an audience. Find a niche you’re comfortable writing about and you have experience in. Find a brand name and domain name that’s catchy but isn’t too specific. Register your website, add social accounts, research and write low competition articles. 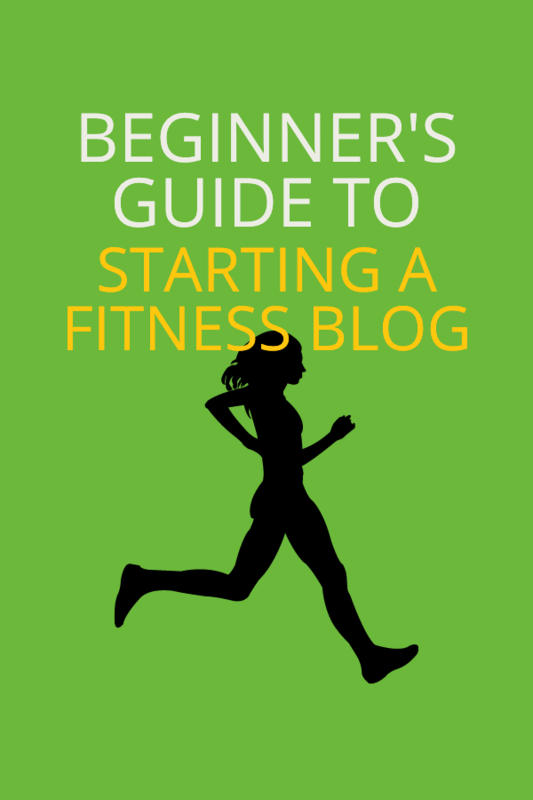 This will sound contradictory, but here goes: don’t just start a fitness blog! Find your niche within the health and fitness world. Otherwise you’ll be competing with the big players in the space, Unless you’ve got a lot of money to throw into your website, you’ll struggle to get any traffic. It’s important to focus on a niche that isn’t dominated by one player or saturated with lots of competitors. The “lose weight” niche is a good example of a topic to avoid. But you can still pick a sub niche that isn’t yet targeted by other blogs. What kind of topic are you interested in? Fitness for beginners, outdoor circuit training, vegetarian fitness, personal fitness, keto diet blogging, fitness for working mums. Once you have a few ideas, it's time to check how easy or hard it would be to break into that niche. Both approaches have advantages and disadvantages. I can’t tell you which to choose but think about your long-term goals. In marketing and SEO world, a keyword refers to a search term in Google. Keywords are topics, words, or phrases that someone types into the search engine. Keywords like “vegan recipes” get thousands of searches a month. Keywords like “best vegan recipes for kids” get fewer searches, but are easier to rank high on Google for. When we say that a website or blog posts ranks for a keyword, we mean that it appears in Google searches. To “rank high” means that the post appears near the top of the results. Website URLs that appear near the top of the search results are more likely to get clicked. The closer to position 1 on Google’s search your blog post appears, the more clicks you will get. More clicks equals more eyeballs. If people read your content, Google’s algorithm takes note and your website builds authority. This is the concept of organic traffic. How to find the keyword search volume and the keyword difficulty? Read my guide to keyword research for beginners. And choose a domain name and a brand name that fits in with these goals. If you choose option 1, the next step is to map out categories and sub-categories in that niche. With option 2, the first thing to do is find your overall blog niche. It’s important to keep in mind that you can have a niche blog with a broad name. This is what I’d recommend for anyone that would like to expand their blog into other areas later on. If you create a blog called Keto Mums, then you won’t be able to expand into the vegan niche. But if you call your blog Food Mums, you can expand without it looking weird. Your blog name doesn’t have to be the same as the domain. It’s so difficult these days to find a decent dot com so it pays not to be too choosy. If your business takes off and the money rolls in, you can rebrand and buy a premium domain name. If you’re still not sure what kind of angle you want to take, start asking friends and family for input. You can sometimes find inspiration in the least expected places. But remember, fitness blog ideas are a dime a dozen. What matters is execution. And here’s how to make it happen. 1. Use a solid foundation: get reliable web hosting. 3. Install a WordPress Theme that doesn’t slow your website down. 6. Write well-formatted, grammar-checked content that is better than the competition. Don’t got crazy with your website’s design when you’re just starting out. The most important things to have are a fast website that’s easy to read and looks professional. Get a professional Premium WordPress theme (hire a developer to make your blog fast and to add everything you need to get going). Stick to 3-5 brand colors to improve branding between pages. Use lots of white space. It’s easy to do with the right tools or service. When you’re ready to level up your blog post and branding, head over the 99 designs and take your pick of dozens of designs created just for you, for a superb price. I’ve seen people struggle with the logo and colors of their website for years while their competitors left them far behind with simple, SEO-optimized websites. Writing for a health and fitness blog is similar to other niches but there are a few differences that can have a huge impact. It’s important to understand the pitfalls and potential issues you might experience on your blogging journey. If you’re not qualified you could risk a manual penalty. Google wants to see people with authority and trust writing in the health niche. Get some form of qualification to prove that you know what you’re talking about. Avoid topics like the usual spammy pills and miracles “cures” that plague the inter webs. Anything that cannot be substantiated should be avoided. Google puts health websites in the Your Money or Your Life (YMYL) category. Anything to do with health or personal finance should be treated carefully. After you’ve created the categories that will define your blog (for now), pick one and research topics within that category. Keyword research is a huge area and too in-depth to cover comprehensively here. But here’s a guide to keyword research to get you started. 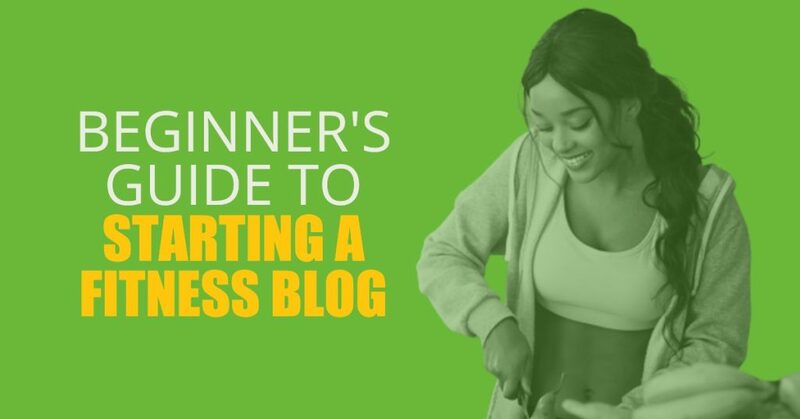 But before diving in, I always suggest to beginner bloggers that they get quick wins right at the start. Getting small amounts of traffic from multiple blog posts right away will help more than waiting 6 months for a post on a highly competitive topic to deliver. Write on topics that will get you results quicker. Avoid focusing on the keyword “men's fitness” if you're new to blogging. Don’t blog every day unless you can produce the best content on the topics you’re writing about. In 2019 it takes a lot of work to get posts on the first page of Google. Competition is too strong. There’s no room for also-rans. If you’re churning out content for content’s sake, expect to fail. Take your time. Do proper research. Write the best article on the Internet on the topic you’ve chosen. Write fewer posts but better content. That’s the best advice I can give. 1 . Search in Google for your topic and look at the results. If you see lots of blog posts from websites like yours, take it as a good sign. If Amazon dominates the top 10 results on Google you can forget about muscling your way in there. A mixture of YouTube videos, blog posts, and Wikipedia-type entries is also a good sign. Ten YouTube videos in a row means Google values video only in the search results for this keyword. 2. See how successful websites have organised their website structure. Here’s how to see what categories of posts any website is using. Look for the Category Sitemap in the list and click on it. Voila! Now you have a list of blog post categories to examine and add to your list. You will need a keyword tool of these if you’re serious about blogging. Keysearch is the most versatile and has some nice exporting features. SE Ranking is another favourite which offers an SEO and Paid Ads keywords tool. 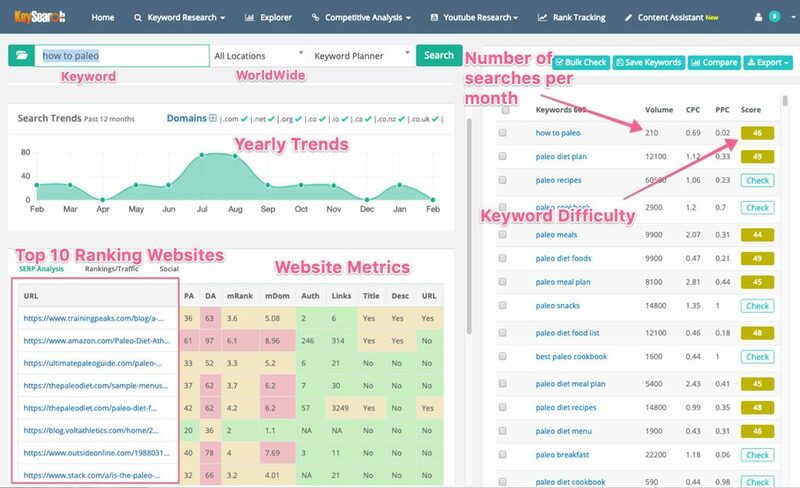 SE Ranking also offers keyword/rank tracking and competitor analysis tools (for checking what keywords your competition ranks for – a great way to get ideas) as part of all packages so it’s worth checking out. UberSuggest is a free keyword tool, but it’s a bit clunky and I don’t trust the results. Use UberSuggest for quick checks but don’t bet your business on it. Open your keyword tool of choice and pop in your search term. We’ll take Keysearch as the keyword tool for this example. The actual wording doesn’t have to be “correct” English as we’re just looking for ideas. “How to paleo”, for example, is a common search term with 210 searches a month. But it’s not an easy phrase to target. As a beginning blogger you’ll want to look for easier search terms. Look for long tail keywords: phrases made up of several (usually 3 or more) words that are only searched for a few times a month. The key is that they are not competitive, meaning few high domain authority websites have produced high quality content on this topic. This is good. It means you have a chance to rank. Using the Filter option, put 3 in the first Number of Words box and click Filter. This narrows down our list of keywords from over 600 to around 250. Let’s say we don’t want to write about cakes or “easy meals”. Add these terms to the Negative Words box. Keywords with a lot of searches a month are generally hard to rank for. So let’s narrow down the results further by adding 10 and 300 to the Volume boxes. This will return results that have search volumes per month of between ten and three hundred. We’re left with 150 search terms and now we can select all the terms and click Bulk Check. 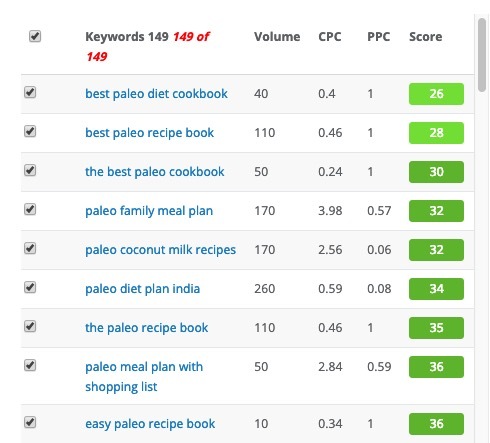 Give Keysearch a few minutes to return a list of great keywords related to paleo. If nutrition is one of your fields of expertise, then “paleo coconut milk recipes”, for example, is a good keyword to write about. There’s a lot more to keyword research. But this is enough to get you going. If your goal is not to try to create the best resource, then don’t bother. There’s a joke that goes around in SEO and marketing. On the second page of Google. (Nobody looks there). Don’t be 15th best. Try to be the best. Write more in-depth, actionable blog posts that cover all the topics in that topic. 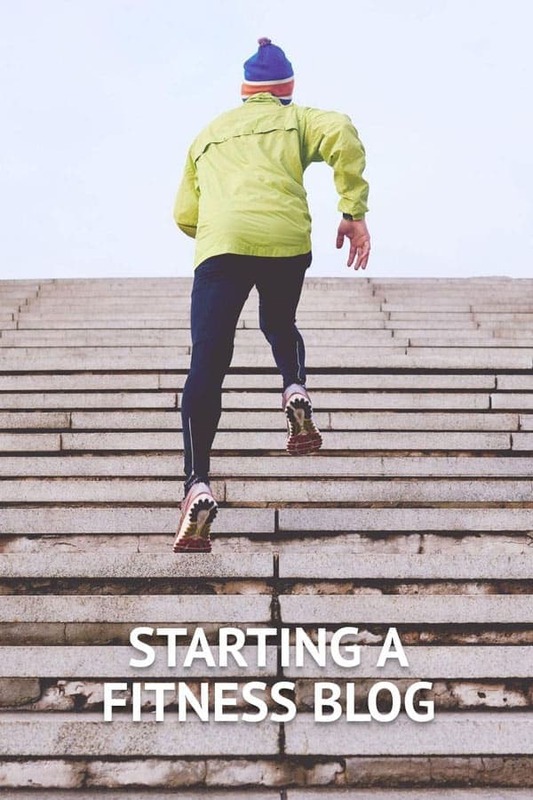 Let’s take a post about “starting a fitness blog” as an example. Perfect! Make sure the meta description is compelling. The meta description does not affect SEO (Google ignores it) but it influences people into clicking. This is super important. Only use H2 headings in the post. Try to write without using h3s as it will help you structure the post better. But you can use them if it’s logical and adds to the content. Forget about everything else. H2 headings should contain important keywords that relate to the main topic. Use short paragraphs and space your text out. Use images to break up the text and make sure they are relevant. Stock images should be a last resort. If you can afford it, have a designer create unique images. Better still, create your own custom graphics using software like RelayThat, Stencil, or PhotoShop. Make sure the images you upload have descriptive titles as filenames. No IMG_2873.jpg please! Reduce the file size to below 300kb. Don’t upload 6MB files unless you want to get no traffic. Add ALT tag descriptions to every image on the post. Make sure they are descriptive of the image. Don’t stuff the ALT tags with keywords. 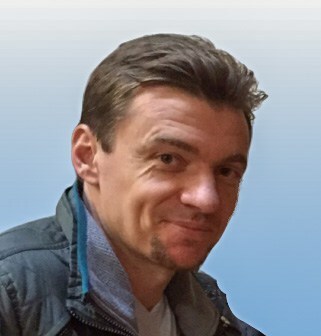 Add a descriptive title and description. If monetization is not a goal of your blog, then you can skip the rest of this article. Some people have high moralistic codes about monetizing blogs, seeing monetization as a sell-out. But most of us can’t afford the luxury of producing something that gives value, with no reward, for years. Getting paid for producing good work is how the world works. Receiving compensation for your work is a good thing. It keeps you motivated to create more. The people that read your website, and by extension, help to pay for it, get value. If you deliver value, your readers are happy. You’re happy. The world is a better place. Forget about the grumblers! Let me show you how making money with a fitness blog helps you and helps your readers at the same time. There is stigma around the idea of affiliate referrals in the marketing world. With the current problem with Instagram influencers promoting products they don’t use in order to get affiliate commissions, this isn’t getting any better. However, people are more aware of affiliate deals now. And there’s nothing wrong with affiliate marketing. In everyday life, when you mention a product to someone you’re acting as an affiliate. You just don’t get receive a commission for the referral. On the internet, it’s true that there are plenty of people promoting products they don’t use. But you don’t have to be like them. Show how much you care about the product or service and show how you use it. CJ.com – One of the oldest affiliate portals. Not the best for conversions. Clickbank – has lots of shady products but there are a few gems. It can take time to find a product you would have no problems promoting. Awin – Affiliate Window is another long-standing Affiliate portal. If you’re okay with the thoughts of putting ads in front of readers, this method of monetisation can be lucrative. But putting ads on your site has disadvantages. Stay away from ad networks like Google Adsense right at the beginning as they slow down your site (ad technology increases the server overhead on your website) and offer little in return. Unless your website receives 20,000 hits a month or more, ad networks will not help. Once you start getting traffic, look at MediaVine, reckoned to be the best ad network for bloggers. Offering banner space to advertisers on your sidebar or in your content is a much better way of controlling ads and getting better returns for new bloggers. Writing and selling ebooks on a website is a popular way of producing your own products to sell. Ebooks are still popular, despite the fact that every man and his dog has one. And people still buy downloadable PDFs, as long as they offer value above and beyond what they can get for free. If you can package your knowledge in an ebook that is convenient and useful to your readers, they might just pay for it. Many bloggers repurpose content from their website into ebook form. Use Designrr to rapidly create ebooks from blog posts or Word documents. One of the hottest topics in 2019 is online courses. Everyone seems to be getting on the course bandwagon. Why? Because it’s profitable and can fit nicely into your blog’s overall vision. Blogging is a great way to build and audience and get “free” traffic. Selling access to courses on your website is a great way to monetize these channels. I’d recommend building the blog and inspiring your audience long before launching a course. It’s harder to sell to people that don’t know you. You can always use paid advertising but this will be expensive. 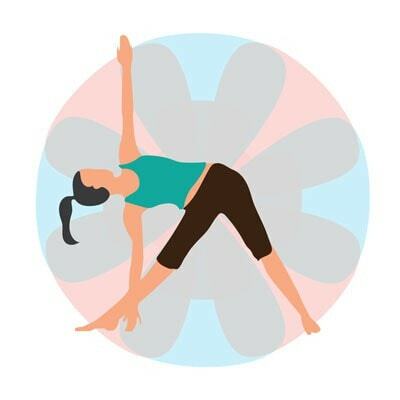 There are several ways to create a course but in the health & fitness niche but it should be highly visual. Unlike, techies who can get away with doing screencasts of their computers and product videos, health & fitness bloggers will need to be on camera. Or at least have a real person on camera. Your audience will want how-to guides, demonstrations, and advice from real people. Teachable is the best platform for creating an online course and incorporating it into your blog. If you’ve got a bigger product to sell, such as an expensive course, a training session, or book, you might need to warm up potential buyers before selling to them. That's where funnels come in. If it sounds like some kind of cloak-and-daggers, smoke-and-mirrors marketing tactic, don’t worry. It’s a simple concept (often made obtuse by people that want your money). A funnel for your blog, business, or service is just like a funnel in real life. Lots of stuff goes in the top and small amounts of stuff comes out the bottom. The difference with virtual funnels is that there’s also a filtering effect. You filter out the people you don’t want in the funnel and what you’re left with, right at the bottom, is a group of people that will buy your stuff or do something else you really want them to do (nothing unsavoury here please). Lead magnet opt-in: Inside the blog post, offer an ebook, free download, or something that people will give their email address for. Segmenting the list: Add the people that opted in to your mailing list to a list of potential leads. Your email marketing software should be able to do this. If not, change provider. Send email sequences: Create an email sequence to send to subscribers. This sequence could include introductions to other blog posts on your site or emails with tips or stories that they would find interesting. Find the buyers: The people that have read all of your emails and interacted with your links are warm leads. Segment them into a list and target them with offers that they might be interested in. Other examples of funnels are using Facebook Ads to get traffic to your blog posts, lead magnets, or signup forms. Pinterest campaigns can also work in this way. I’ve built tens (maybe hundreds) of blogs and many of them have been a huge success. I currently run a blog in the fitness space and manage several clients in health and fitness. These are the tools and services I use to manage fitness and health blogs. Hosting – Use SiteGround web hosting. Avoid GoDaddy and BlueHost like the plague. Next. WordPress Theme – Genesis themes from StudioPress are the best products on the market. For a more economic alternative, try Astra Theme. If you like the WordPress themes from StudioPress, it might be worth your while looking at WPEngine hosting. It’s a bit more expensive than SiteGround but the themes come bundled with the hosting plans. A nice little bonus for new sites! Scheduling – Bookafy is a superb scheduling software for client and business contact scheduling. Landing pages – To sell a product or tell people about your services, launches, or affiliate products, you need a landing page. And the better the page, the better the results. OptimizePress is an easy-to-use landing page and sales page builder. Email Marketing – New bloggers should check out Mailerlite. More advanced users can try Active Campaign. MailChimp is popular for new bloggers but I’ve moved away from it in the last few years. MailChimp can get very expensive with bigger lists. The interface is clunky and unintuitive and has never been improved. Video hosting – Unless you want ads on your videos, you’ll need something a bit more professional than YouTube. Try Vimeo or VooPlayer. YouTube embedded videos on your website can also lead people to your competitors. The “related videos” feature can no longer be switched off. Video Creation – Producing high-quality videos for social media and blogs is no longer expensive. Software like Wave.Video from Animatron makes the process easy and economic. The results are amazing. Idea database and note-taking – Evernote is great for brainstorming, saving web pages, creating blog posts, and lots more. Project management – Trello is simple and effective. And 100% free. Image and document storage – Google Drive or pCloud. Payments – If you plan to sell products directly from a sales page, ThriveCart is far ahead of any other system for convenience. ThriveCart gives you high converting checkout pages and upsells. Use Stripe payments to accept credit cards. Pabbly payments is another option for recurring and easy sales page management. Documentation and drafting – Google Docs gives you the ability to edit, comment, share, and make changes in real time with collaborators. Lead magnets and opt-in bars – ConvertFul. Keyword tracking – SE Ranking. Yoast SEO, not for gaming the system (which it's not able to do) but for the tools that it offers. Anti-Spam for a free spam removal tool. So there you have it. 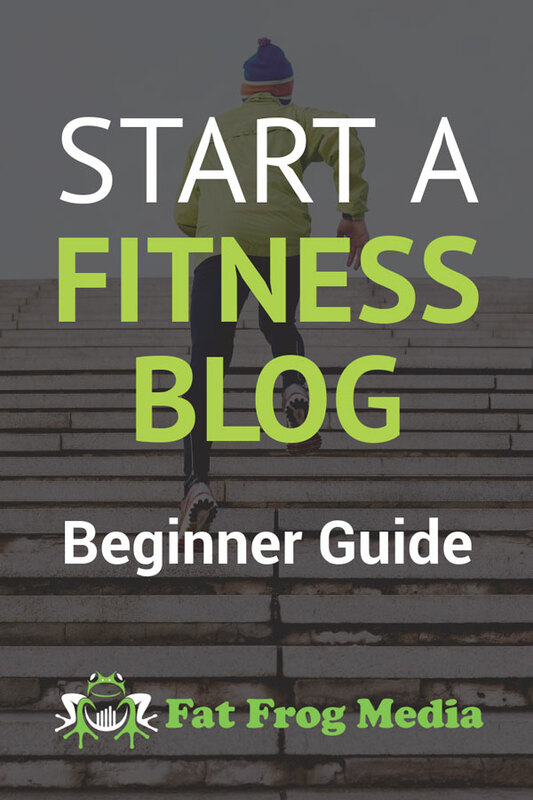 The complete guide on how to start a successful fitness blog. Let me know if there's anything you'd like me to elaborate on and please feel free to leave your suggestions and comments below.